The BarberShop Initiative®addresses the lack of readily available, understandable and accurate cancer-related information in areas with significant high-risk, and/or racial minority populations. Through the BarberShop Initiative®, The Prostate Net® has forged partnerships between barbers and medical centers to directly deliver crucial information about prostate cancer prevention, treatment and supportive care in a sensitive and culturally acceptable manner. Historically, educational and outreach efforts to Black communities for health screening or clinical trials have not been particularly successful, due to limited community and individual participation. Within minority communities, the barber and his shop have an important position as a place for social interaction and where free and open discourse occurs. Tapping into the barber's leadership to inform and influence his/her clients and neighbors has been an effective way to reduce and/or eliminate cultural barriers encountered when health care messages come from the traditional health care establishment. Starting in 2004, the program targeted selected medical centers serving certain minority communities, then recruited and trained local barbers from the affected service area to function as lay health educators and patient navigators who motivate their constituencies to get screened and treated for prostate cancer. The medical centers found that this program enabled them to achieve a higher level of community and patient service - and to save lives. In the first year more than 30,000 men received prostate cancer screening tests, and more than 400 prostate cancers were discovered, along with other co-morbidities such as colorectal cancer, diabetes, etc. The program evolved through expansion of the concept to more medical centers in the United States that focused on the initiative to increase prostate cancer clinical trial participation as well as to increase patient access to their services and to provide a channel of dialogue with the communities to address disparities in other disease areas, such as obesity/diabetes, colorectal cancer, etc. Building on our "Knowledge Net" program's technology, the BarberShop Initiative® placed computer terminals in selected barbershops. These terminals were used exclusively to provide current information about prostate cancer detection and treatment through the Prostate Net website. Data reflecting the number of Knowledge Net users and the type of information accessed was also gathered and used by the initiative to better understand the needs of the populations served. The program was used by public health agencies in New Jersey, Chicago, Atlanta, Philadelphia, and New York City as part of epidemiological research studies to better target the needs of racially disproportionately impacted communities and to identify interventional tools that could improve disease specific risk and educational needs. An outgrowth of the U.S. program has been implementation of the initiative in Orissa Province in India as part of a prostate cancer awareness and tobacco cessation program, in Australia as an initiative supported by the Prostate Cancer Foundations of Australia and New Zealand, and planned for Switzerland in 2017. 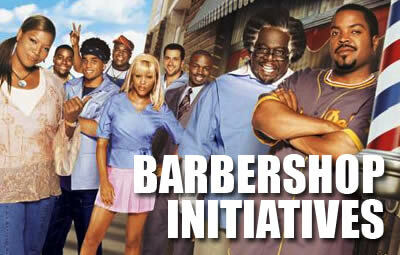 From this point the BarberShop Initiative® evolved to its present form wherein it functions as a partnering agency with the Centers for Disease Control's Comprehensive Cancer Control Centers in 16 city/state locations that have existing programs of cancer education, intervention and/or screening. The objective is to utilize a local network of barbers and barbershops as channels of information dissemination and motivators for participation in the local CCCC programs to reduce the incidence and mortality of prostate cancer within the identified target communities. Program managers from The Prostate Net will work with the local public health agency staff in recruiting and training barbers, training the local agency staff in how to establish effective networks of engagement, establishing performance measures, and in providing on-going support for the initiatives. Contact us to help customize a program for your market, consumers, patients and/or health service objectives. The Prostate Cancer Asociation of Australia teams with local "Bikkies" to spread the word about "Supporting Quality of Life for Men with Prostate Cancer." Public Service Announcement - Dr. Alan T. Simpson, JR.